Al-Joumhouria newspaper reported on Saturday that the decision to appoint judge Salim Jreissati as the new Labor Minister to replace former minister Charbel Nahhas was made by Hezbollah and approved by Free patriotic movement leader MP Michel Aoun. 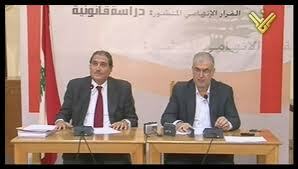 Jreissati had held a press conference last August with the head of Hezbollah parliamentary bloc MP Mohammed Raad to discuss the legality of the Special Tribunal for Lebanon STL. According to observers Hezbollah will now have its own representative inside the cabinet to fight STL because Jreissati will serve as the opponent of the UN backed court . Observers criticized President Michel Suleiman and Prime minister Nagib Mikati for rushing to sign decree 7609 approving Jreissati as the new Labor minister. Jreissati currently provides the defense lawyers who were appointed by STL to defend the four Hezbollah members. 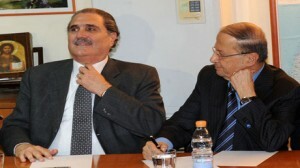 Jreissati told al-Manar television on Friday that Aoun’s choice to appoint him as minister was a “strategic one”. In August 2011, just weeks after STL issued its indictment against the four suspects, Jreissati took part in a conference organized by Hezbollah in which he delivered a presentation entitled “The Published Indictment: A Legal Study.” In the speech, Jreissati attacked the legitimacy of the court and pointed to what he described as “various gaps” in the indictment. He said the indictments were based on weak circumstantial evidence. According to Al-Joumhouria , a Hezbullah delegation had visited Rabieh on Thursday during which it requested that Aoun appoint judge Salim Jreissati instead of his candidates Joseph Jreissati and Nadim Latif. Jreissati visited Aoun on Friday . Following their meeting Aoun announced that newly-appointed Labor Minister had become the newest members of the Change and Reform bloc. Unfortunately for HA and Aoun they really can not do anything to the STL since its under chapter 7 of the U.N witch is not linked to an requires no approval from the country in question in this case Lebanon. Lebanon can not do anything to stop the STL no matter what. Its the same type of court witch was setup for the Yugoslavia conflict and HA and its allies are using the same methods Milosovic used to discredit the court. With or against the STL you cant do anything to stop it. I personally think its a good step even though I dont trust the U.N or international community because of previous experiences but if it brings real justice to Lebanon then Im all for it. Knock it off. The question to ask if a person satisfies the title of being a human is based on his actions not his physical appearances. It doesn’t matter what people believe in or which organization they belong to. There is one universal law on this planet in being a human: you don’t kill your kind. I think youre funny. Are you from Nigeria ? Seriously though Im the only person that may agree with you on this website so chill out freak. Knock it off. The question to ask if a person satisfies the title of being a human is based on his actions not his physical appearances. It doesn’t matter what people beleive in or which organization they belong to. There is one universal law on this planet in being a human: you don’t kill your kind. That top picture — ‘one fat fxxk looking at another’! Unfortunately, if he ‘worked’ on his English, then you might be able to understand him. Be careful what you ask for … you might actually receive it!